Smooth, rich and holographic sound from a 7 inch cube with a removable safety glass cover. 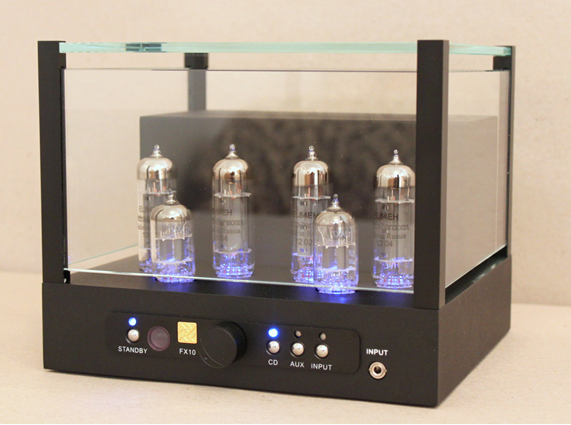 A small but feature laden integrated vacuum tube amplifier, the unit has automatic biasing, can easily push 89 dB speakers, remote control, inputs of two RCA sets and one mini-jack with and 4 and 8 ohm speaker posts. Yes, it does come with the blue tube lights. Comes in black and silver colors. 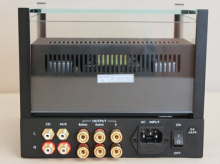 Fully Integrated Stereo Amplifier: Input 670 mV driving 10 watts. Remote Control: On/off, volume, selector, mute. 2 matched pairs (4) of EL84 power output; 2 pcs. 12AX7 preamplifier. 8 inches wide by 7 inches deep by 7 inches high. 12 pounds net, approximately 16 pounds packaged. Nine months limited parts and labor. 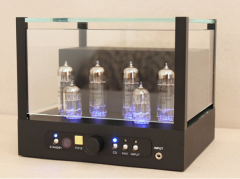 Tube Complement: 2 matched pairs (4) of EL84 power output; 2 pcs. 12AX7 preamplifier. Dimensions: 8 inches wide by 7 inches deep by 7 inches high. Weight: 12 pounds net, approximately 16 pounds packaged. Warranty: Nine months limited parts and labor. 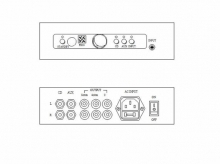 o Fully Integrated Stereo Amplifier: Input 670 mV driving 10 watts. o Remote Control: On/off, volume, selector, mute. o State of the Art Components: Gold plated RCA input jacks, gold plated five way speaker connectors. Special Holiday Price ! Price includes freight !!! These units sell out very fast just prior to the holidays dont wait until the last minute place your order now and ensure a unit for yourself ! ( Good only for Domestic USA locations only not good for Hi or Alaska ) do not select any shipping method when ordering . 10 watts of oure tube power, complete with remote,power cord, and cable for ipod. All Jolida units are shipped via Fedex ground with signature required upon receipt. Price includes freight....Not sure about this model? Have questions? Email us and we'll be glad to consult you or address your concerns, info@newtube.com. All units are pretested and burned in for 48 hours prior to shipping by the techs at Jolida . Although shipping is free to locations in the domestic US (lower 48 states) it is not free for overseas shipments or to Canada. This can be expensive and the search for a carrier with the best rate could take hours of painstaking quoting. As a result we use Fedex. However if you have a specific freight carrier that you are familiar with or have an account with that can pick up from the state of Maryland let us know and we will use them. In such cases the shipping must be prepaid or shipped using your verified account # with such carrier. We are not shipping experts for overseas shipments so if you can suggest a carrier let us know. Please read our return policy on jolida items in "Policies"